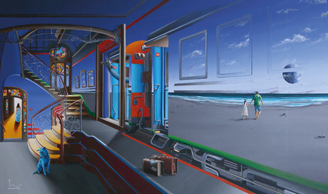 Olivier Lamboray, a Belgian surrealist painter, is on year 22 of his artistic journey filled with dedication and discovery. Projecting a harmonious balance of whimsical color pallets with the seductive mystery of surrealism, the artist explores the dynamic shapes of architecture through their relationships with color and their manipulated surroundings. The presence of animals in his works reflects both the great value of all spectra of life and the compassion he holds for it. Through his mastery of classic painting techniques and his vast experience as a world traveler, Olivier Lamboray creates a multilayered representation of his continuous search for balance between illusion and reality with each piece. Lamboray’s works have garnered international acclaim and have been featured on the front covers of American Art Book and Art Quench Magazine. He has also been hosted as an honorary guest for numerous art expositions around the word as a result of his high achievements. 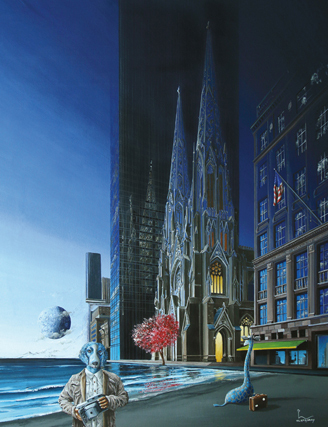 Mahlstedt Gallery is thrilled to represent Olivier Lamboray, a visionary of modern surrealism. It's working on very small paintings that I came across the crop of my painting "Holy Cow, it's Summer" and decided to do a smaller painting out of it, The clock appeared as the moon out of the time machine holographic thing.. and I became very surprised how creation worked and how it all came out together.